Giving and receiving an engagement ring is a time-honored process that kicks off an exciting time in your life. Getting engaged is also a potentially sensitive time given the number of expectations and rituals surrounding this major milestone. Learn the various aspects of etiquette surrounding the topic of engagement rings to help you make the right decision for your particular situation. With so many options for engagement rings, it's important to consider a variety of etiquette-related factors when deciding what type of ring - if any - is right for your relationship and how to go about making this important purchase. An engagement ring isn't required to propose; some couples get engaged and then shop for the ring together so that the woman can choose her own ring. Other couples get swept away with a spontaneous proposal long before a ring is purchased. Waiting on a ring is a good idea if a couple wants to save money for a special ring but doesn't want to wait to get engaged. Of course, there's also the option of foregoing an engagement ring altogether. While these types of rings are traditional, they are certainly not absolutely necessary. Traditional engagement etiquette dictates that the groom buys the engagement ring. However, some couples decide to split the cost. Men should consider their fiancée's personality before suggesting she contribute to the ring payment, as even some very modern women expect the man to buy the ring. If the woman is generally a romantic, it is highly likely she expects her fiancé to carry out this tradition. When couples decide to share the cost of the ring, planning and budgeting can be a good opportunity to get insight into one another's economic viewpoints long before the marriage, which can help form the basis for a healthy financial future. While traditional engagement rings are set with diamonds, newer rings can be set with any gemstone, or a combination of gemstones. Traditional looks can still be maintained by having a central diamond framed with different accent gems, or consider a more modern or bolder look of a colored gemstone surrounded by diamonds. The most important thing is to feel comfortable with a ring that suits you. While ideally each engagement would lead to nuptials and each each marriage would last "until death do us part," that is necessarily the case. Broken engagements and rising divorce rates may mean that one of the parties may already have an engagement ring on hand. The decision to reuse a ring is an extremely personal one: the wearer may simply like the style of ring and see no need for another. On the other hand, one or both partners may wish to have a fresh start with a new ring unassociated with past relationships. This should be a mutual decision, and previously-used rings can always be reworked or slightly reset in order to be renewed without extensive renovations. Heirloom engagement rings are not only symbolic of the giver's love; they are also full of tradition and family memories. Make certain other family members agree with the decision, however, so there will not be familial strife over who possesses the jewelry. Also be sure to make provisions for the ring to be returned to the family in the event the relationship does not work out. 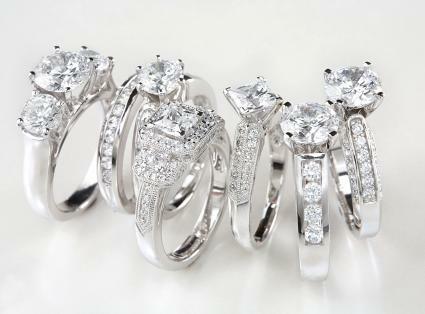 While most men wear only a wedding band, some want to wear an engagement ring as a symbol of their impending nuptials. Men's engagement rings vary significantly from women's, but there are many options for style preferences. If the man does choose to wear this type of jewelry, be aware that conservative family members may assume it means the wedding has already taken place. The couple should be prepared to explain their preferences. While the final decision on where to put your engagement ring ultimately lies with you, it's a good idea to be aware of traditional ring placement before, during and after the wedding. Modern tradition dictates the engagement ring be worn on the ring finger of the left hand. With jewelers advocating right hand rings without relationship affiliations, this is the best way to indicate your engagement as well as follow proper etiquette. The wedding band is traditionally worn closest to the heart, with the engagement ring on top of it. At the wedding, the groom will slide the wedding band on the bride's finger, so there can be a dilemma as to what to do with the engagement ring during the ceremony. There are no specific rules that have to be followed. Some women simply leave the engagement rings on their fingers and switch placement later. Others wear their engagement rings on their right hand until after the ceremony. Some couples have the bridal set soldered together before the wedding; in this case the groom can place both rings on her finger during the ceremony, in the proper order. While everyone hopes for a smooth engagement beginning with a ring and ending with another, it doesn't always work out that way. Learn to handle the most common problems as they arise so you can handle them properly. Some states' laws dictate that the ring must be given back because it was a gift. Other states agree that if the man broke off the engagement, the woman has the right to keep the ring. Other states look at engagement rings as unconditional gifts that the bride can keep regardless of the circumstances. If the ring is an heirloom, there may be a question about the ethics of returning the ring regardless of what the law allows. In general, it is in good taste for the woman to offer to return the ring after a broken engagement, while the man is free to refuse it. For very expensive or heirloom rings, couples may want to have a prenuptial agreement drawn up before the wedding. This could be a difficult dilemma if you didn't have any input on the style of your ring, but your fiancé spent a lot of time selecting it or if it is a family heirloom. To avoid hurt feelings and hidden resentments, be honest and discuss the situation. Make it clear that you don't question the emotion behind the gift, but that the style simply doesn't suit you. It may be possible to restyle the ring, using the stone but changing the band and setting, or you may wish to return the ring and select a more appropriate one together. An engagement ring is more than just a sparkling piece of jewelry. It is a symbol of a couple's relationship, and it should be treated with all the proper respect due that relationship. Understanding proper etiquette when it comes to engagement rings is critical to honor both the ring itself and the commitment it represents.